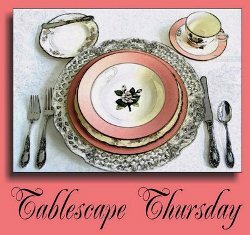 Welcome to the 331st Tablescape Thursday! 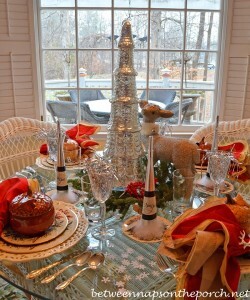 Recently, my friend Bonnie created a beautiful winter tablescape for a New Year’s Eve dinner. This table setting included a Santa centerpiece dressed all in white, so this table would also work great as a Christmas tablescape, too. 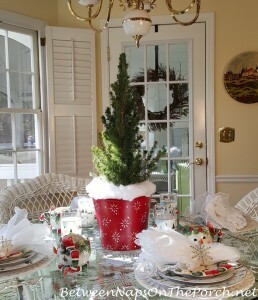 Take away the Santa and this table setting would work great any time during the winter months. Bonnie caught the Blue Hour in several of photos! Everything is so pretty contrasting against that Blue Hour sky. Love these cute New Year’s salad plates! Bonnie found them many years ago in a Gilroy Outlet. The beautiful charger plates are from Joss & Main. This salad plates depicts a cork exploding out of a champagne bottle. You can practically hear the sound, can’t you? What fun plates! 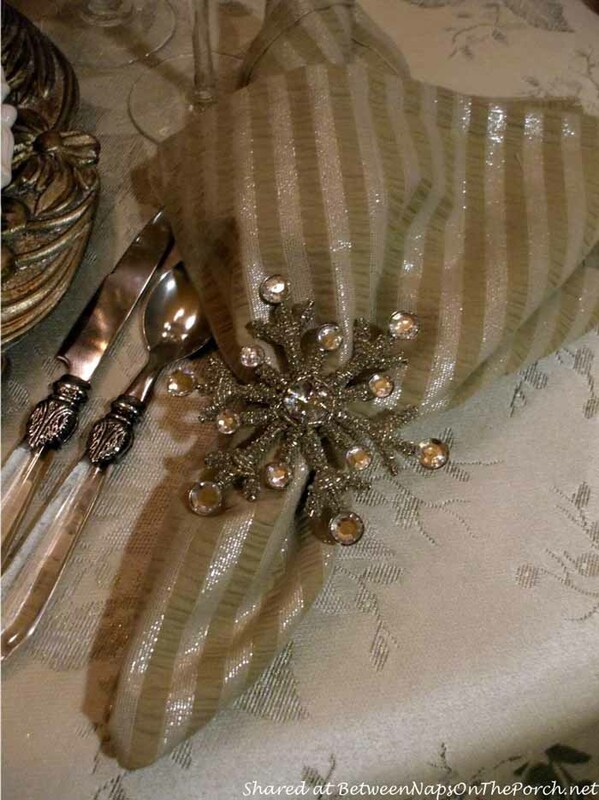 Snowflake napkin rings from Pier 1 work beautifully with the snowflakes hanging down from the chandelier. 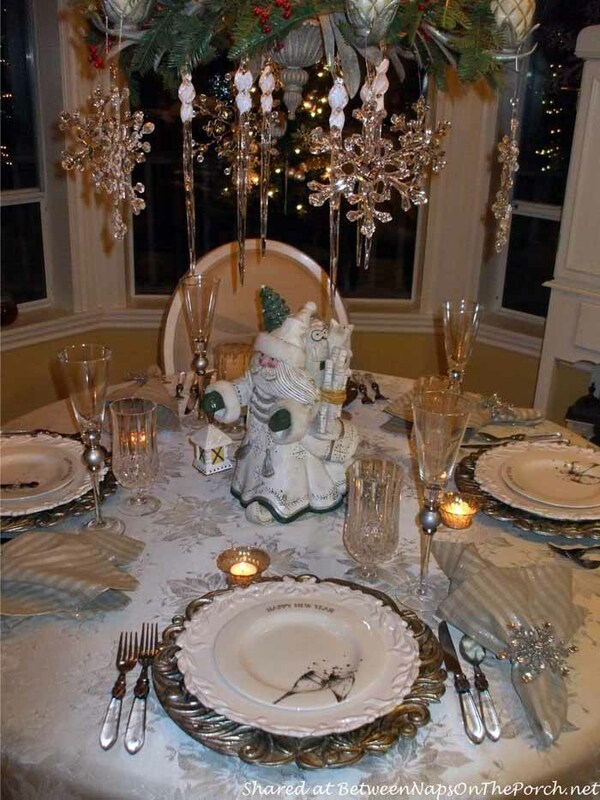 Thanks so much to Bonnie for sharing her fabulous 2015 New Year’s table setting! Keep those snowflake decorations out. Christmas may be behind us, but winter isn’t over yet! 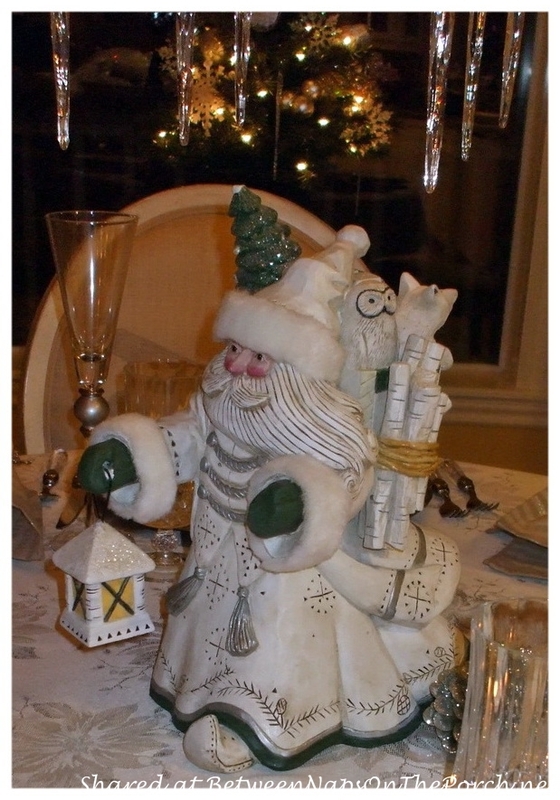 Santa centerpiece – Pam Schifferl, Christmas at the Cove in Pacifica, very old. 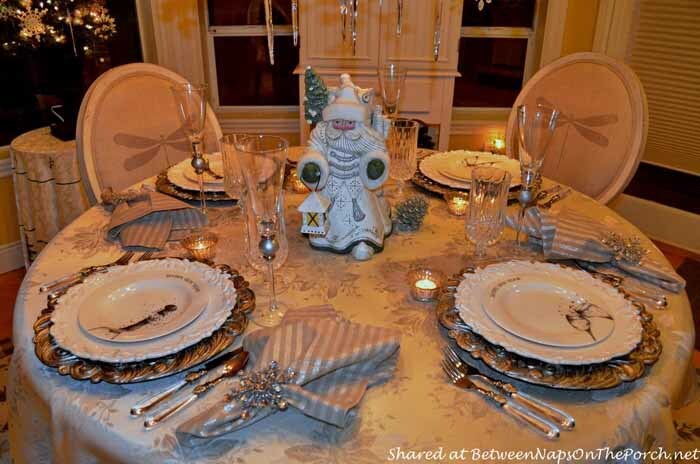 Please do not link up table settings that were just recently shared for a previous Tablescape Thursday. Bonnie did it again. Such a gorgeous way to welcome the new year. Oh my! The room, during the Blue Hour, took my breath. The snowflakes, sparkling on the chandelier and on the napkin rings made all of it so festive. 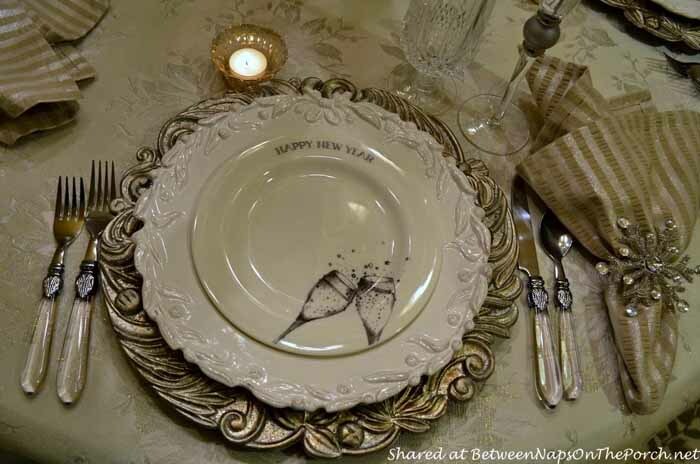 Love the New Year’s plates, and those chargers are exquisite. Thank you, Susan and Bonnie, for sharing this inspiration. That was a very pretty tablescape she created! 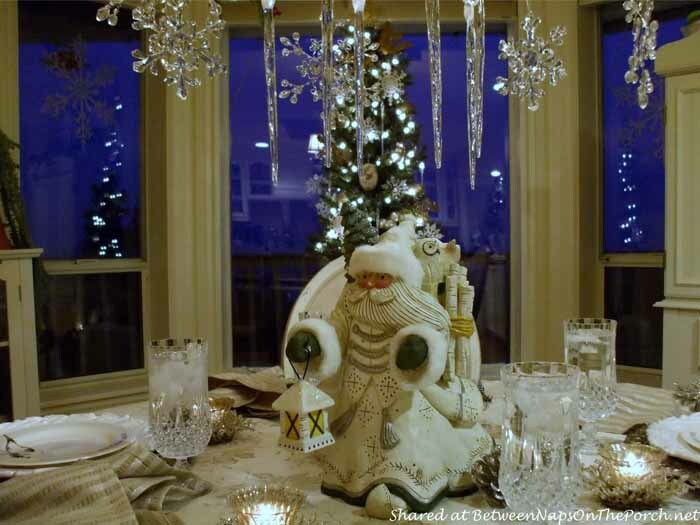 Love the santa and the decorated chandelier with dangling iclicles and snowflakes. What a lucky find with those New Year’s plates- definitely keepers! The blue hour is gorgeous and does created a perfect background! Thank you for sharing and for the party! Liz, I wanted to let you know I followed your link above and loved your table scape. The colors were great. I especially loved the rooster plates, wire basket and checked napkins. I tried to leave you a comment but couldn’t because I don’t have any of those accounts. Very cute table though! Thank you Pam. I’m sorry you couldn’t leave a message on my blog. Beautiful! I especially like the crystal snowflakes on the chandelier. Where on earth did you find them? Thank you so much for sharing! Thanks so much, Maggie! I found the small snowflakes and the long icicles at Home Goods, and the larger snowflakes were found at TJ Maxx. Thank you so much for the party each week! Gorgeous! One of the prettiest table scapes you’ve ever posted. I especially love what she did with her chandelier. And I’m very interested in those dragonfly chairs, do you know anything about where she might have found them? Hi Robin… Thanks so much! As for the chairs/dining set, I bought them 15 years ago at a local furniture store. If memory serves me, they’re from the Tommy Bahama collection. Absolutely lovely setting! The plates and chargers, the napkins! So pretty! Thank you for hosting this week and sharing with us! This is an absolutely gorgeous tablescape. It is so warm and inviting. You did a fabulous job! What a fun table. Those plates are perfect for New Years. I love her photos with the blue hour, especially against the white frosty table! Thanks always for hosting this great party! Have a wonderful week! Santa looks more like the wizard from Santa Claus Is Coming To Town. Too cute. 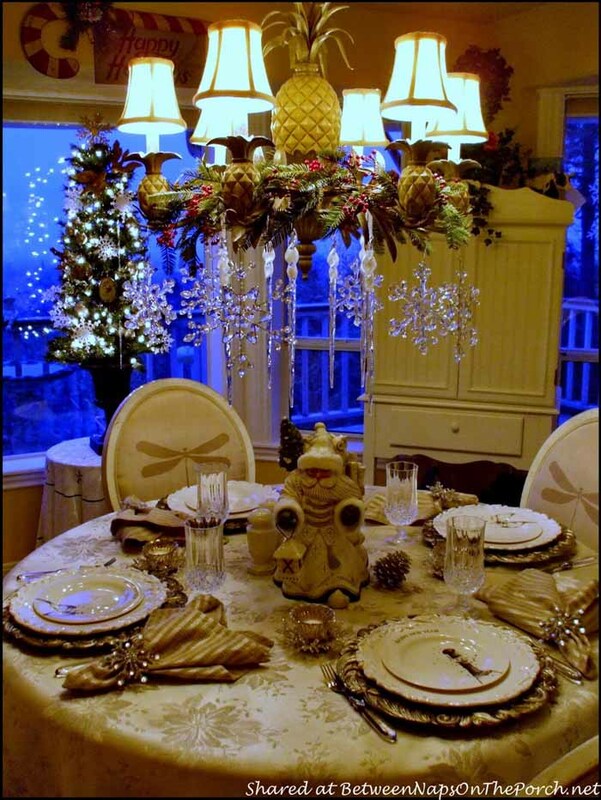 I love the idea of hanging things from the chandelier to incorporate the whole dining room into the theme. I was so excited yesterday and couldn’t wait for today then I realized I don’t know how to upload a regular pic. Our tablescape for Easter. It’s so cute. I need to look for that app, too! There’s a site online that tells you exactly when the Blue Hour is, too. Lisa, just add a line at the end of your post saying something like: “I’m participating in Tablescape Thursday at Between Naps On The Porch” and make it a link back to the party and you should be able to link up using the blue “Add your link” button that you’ll find at the end of the party post here at BNOTP. You’ll find a bit more information about linking up here: https://betweennapsontheporch.net/metamorphosis-monday/ Email me if you have any questions…I’m glad to help. I will try it again this week. Thanks!! Bonnie’s table truly sparkles. As I look out the window this morning, the windows are sparkling with rain drops. It is bitter cold here for certain! 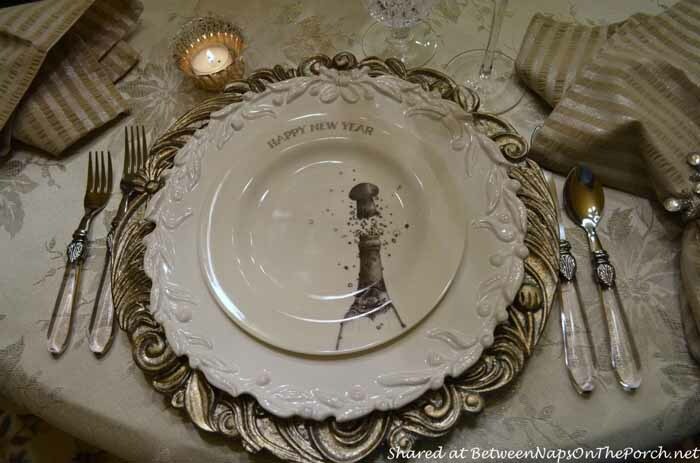 The New Year’s plates with a champagne theme are so cute. I’ve not seen any plates specific to New Year’s. Been thinking of you, Susan. I know it is a difficult time. Sending big hugs your way. Every one of her touches is just right. I very much like the magic of the snowflakes and the chandelier. Everything about these pictures are beautifully done! From the table settings to the Blue Hour it is all absolutely wonderful! To add to your idea of removing the Santa for a New Years Eve dinner party, I would suggest a collection of clocks gathered from around the house and used as a centerpiece. If there were alarm clocks in the mix, they could be set to go off at mid-night! What fun! 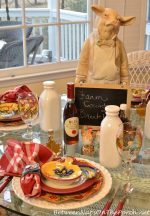 Many thanks to Susan for graciously sharing my table and hosting this wonderful, inspiring blog. ♥ Wishing everyone a happy, healthy and prosperous new year! 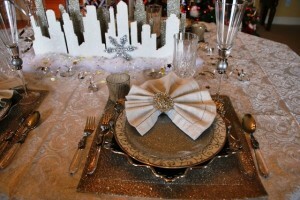 Stunning tablescape, very COOL ! Keep Christmas in your heart year round. Those New Year’s plates are fantastic! I hang snowflakes almost exactly like that on my chandelier for Christmas, too! 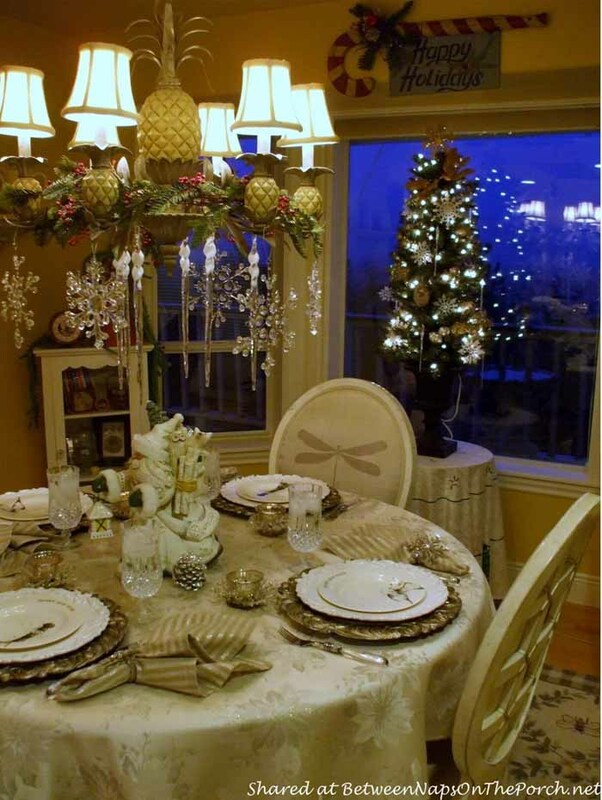 Thank you for sharing Bonnie, The table setting is wonderful. I love winter tables and this one is one of the prettiest yet. I think the icy/snowy chandelier is what puts this table over the top. I have been infatuated with decorated chandeliers this year. I hope to have a chandelier to decorate for next year.